Of course, I’ve drawn breath all my life, but I really learned how to breathe on a freediving trip in the Bahamas. 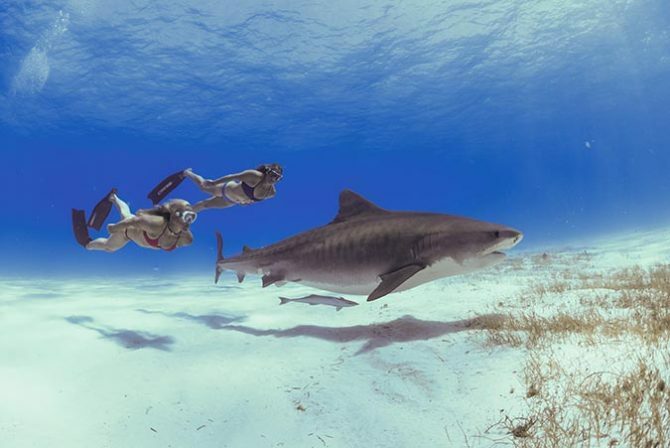 Liz Parkinson, one of my favorite friends and an ex-college roommate, had invited me to the West End of Grand Bahamas to tag along on a freediving trip with tiger sharks, something that I have always wanted to do. Liz swims with sharks for a living in the name of conservation, and while most people find them terrifying, swimming next to, and coexisting with, large fishy predators is her passion and she is amazing at it. Although I’ve always thought of myself as a fairly decent freediver, I’d never really spent any time learning the fundamentals behind it; cruising next to a 16-foot pregnant female tiger shark on just one breath really put my relaxation skills (or lack thereof) into perspective. Trying to keep your heart rate down when an animal the size of a Volkswagen Bus is swimming at you isn’t exactly the easiest thing to do. After the first day of the trip, I really started to appreciate the importance of relaxing and holding my breath the right way, so I had Liz teach me some of the basics of legitimate freediving, starting with the ‘breathe-up’ technique. The ‘breathe-up’ is basically a cycle of diaphragmatic breathing, or belly breathing, aimed at lowering your heart rate and preparing your body to stay relaxed underwater for an extended period of time. As it turns out, the ‘breathe up’ technique isn’t just helpful for relaxing underwater, it has some everyday applications as well. Diaphragmatic breathing has been shown to reduce stress hormones adrenaline and cortisol. In addition, practicing the ‘breathe-up’ first thing in the morning can serve as a kind of meditative practice, helping you to relax, to stay calm, and to improve focus by increasing blood flow to the prefrontal cortex of the brain. For the most part, a healthy human is only two deep breaths away from 100 percent blood oxygen saturation, so using the ‘breathe-up’ has more to do with relaxing than actual oxygen saturation. However, relaxation does promote oxygen storage in the body, and belly breathing pulls air into the voluminous bottom of the lungs. The breathing cycle used in the ‘breathe-up’ also helps rid the body of toxic air that has built up in the lungs throughout the day, or after exercising. Breathing exercises in general help to balance out the sympathetic and parasympathetic nervous systems. By slowing down breathing, the parasympathetic nervous system is activated, resulting in a variety of health benefits including lowered heart rate, lowered blood pressure, increased energy, improved mood, reduced anxiety, improved sleep and better digestion. Start by lying, sitting, or standing in a comfortable position. Place one hand on your belly and the other hand on your chest. Take in a big breath, using the breath to push the belly hand out, while keeping the chest hand stationary. If you take a deep enough breath in, the chest will eventually expand, but only after the belly has already expanded. Hold that big breath for 2 counts. Exhale slowly over 10 counts. Repeat this cycle for 5 to 10 minutes. The ‘breathe-up’ can also be done in a pool or in the ocean, which adds in the benefits of the mammalian dive reflex, an innate response to facial contact with, and submersion in, cold water (under supervision, never practice the ‘breathe-up’ alone in water). Holding on to the side of a pool while standing or to a dive float, remove your mask and completely immerse your face while breathing through a snorkel. Doing the exercise this way will activate the dive reflex, which automatically decreases heart rate by about 15-25 percent and promotes a number of other physiological changes that optimize oxygen conservation in the body.